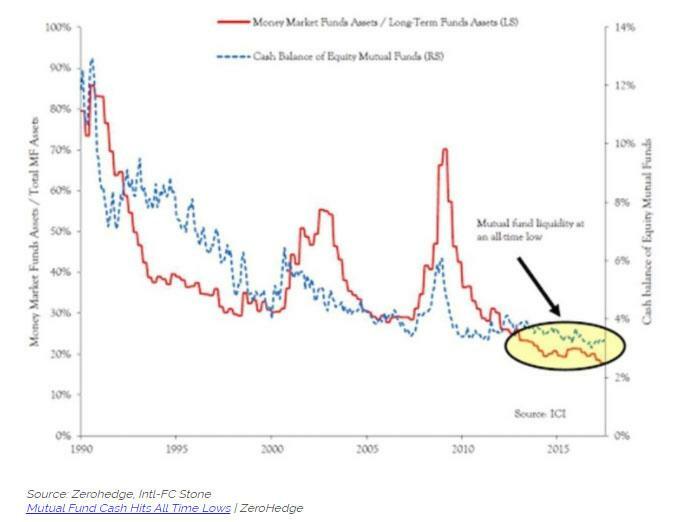 According to Fasanara Capital, which has long argued that the market's systemic fragility is approaching its breaking point, markets stand at a critical juncture, ready to snap, as the following note from Fasanara's Francesco Filia lays out. Viewed as a combination of intertwined components, each component is showing growing signs of pressure and seem to be running out of road for further advancing. The synchronicity of them, more than any single component taken independently, is what should draw attention, as it compounds systemic risk. What happens when the system is tight in its key possible directions of expansion? That it expands no more. Stochastically, on one of the components a tipping point is reached, which jumpstarts the autolytic effect, spreading back through the vectors of the complex system, and snapping the unstable equilibrium into an alternative stable state. That is our thesis. 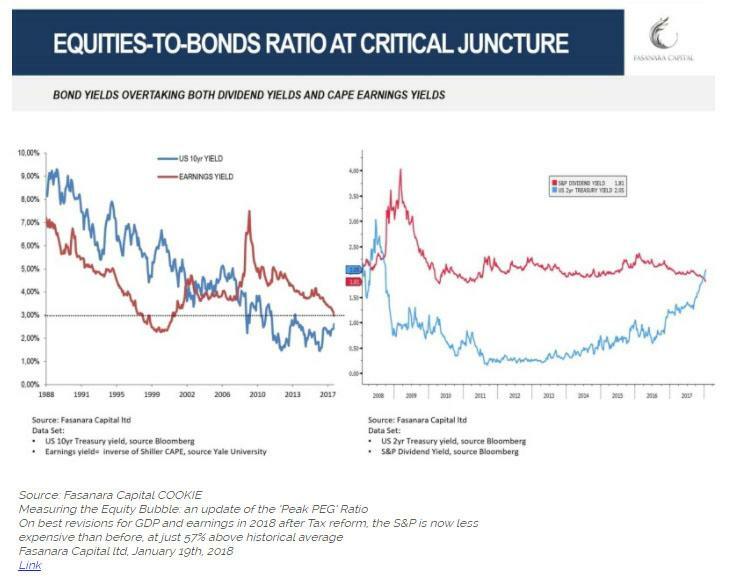 In this recent interview, we discuss the impending tipping points for markets due to a synchronicity of excess valuations, excess indebtedness, excessively low cash balances and a drawback in excessive public flows. Let’s give a cursory look across the four components. Again, the list is by no means exhaustive, but rather a work-in-progress (seemingly endless) collecting of data points, following on to our previous work of ‘a long list of anomalies’ here and here. 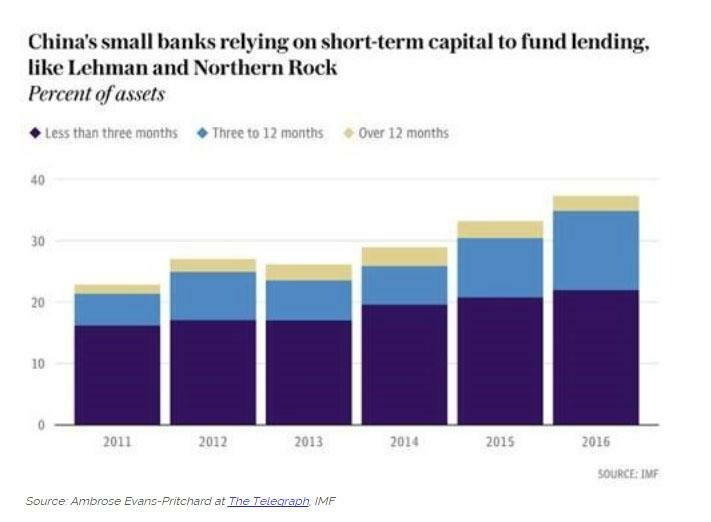 Is all this due to Central Bank flows? Yes of course. Make sense? Of course not. Indication of a sensible and sustainable market? Probably not. Probability that insanity (and instability) permeates to nearby asset classes, i.e. 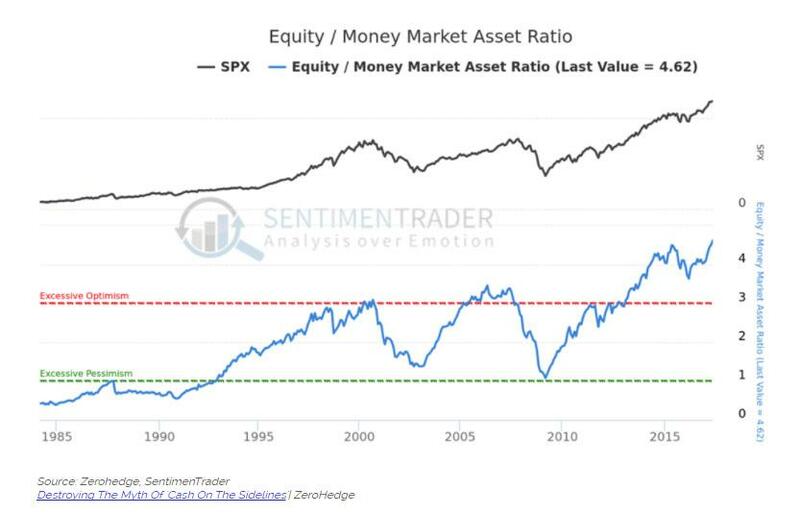 equity? High. 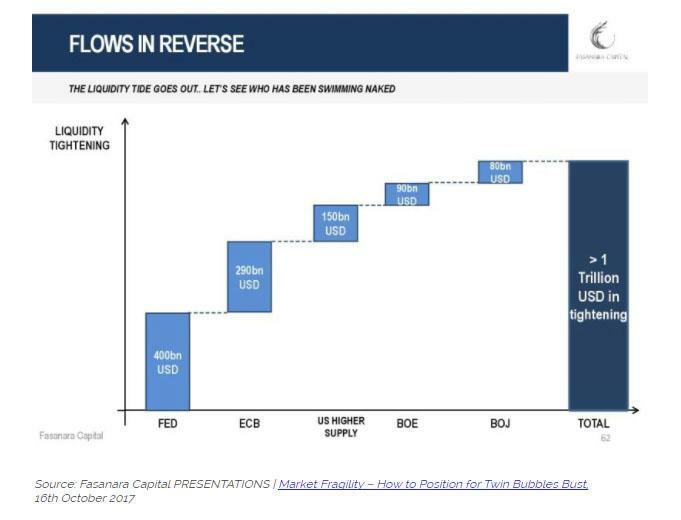 Covenant-lite is becoming not the exception but rather the norm in the Leveraged Loan markets, across the US and Europe. 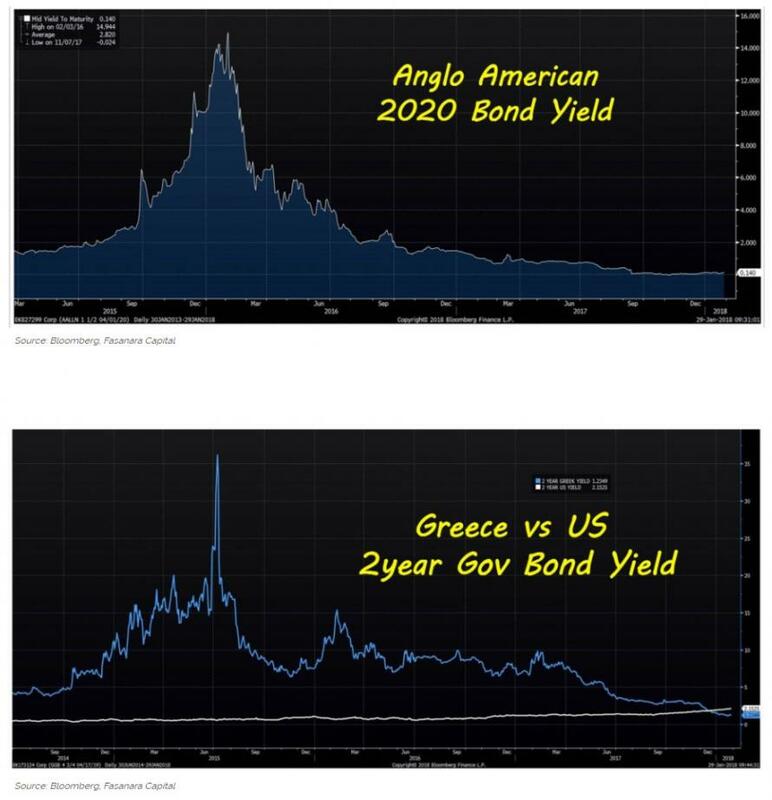 Not only yields are minuscule, but the kind of investor protection at those yield is minimal by historical standards. Counterintuitively, cov-lite are not even signature features of best borrowers: instead, defaults happen mostly within the cov-lite space. 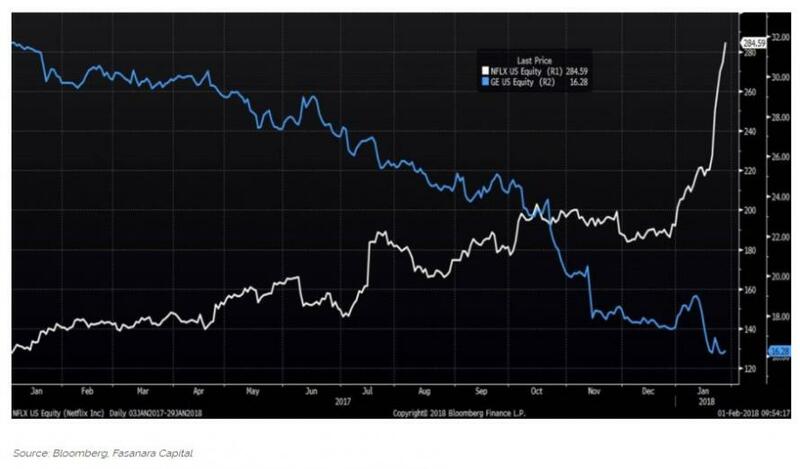 Netflix gained 52% in January 2018 alone. With the result that Netflix is now days away from crossing General Electric in market cap, despite the latter being 10X larger in revenues. 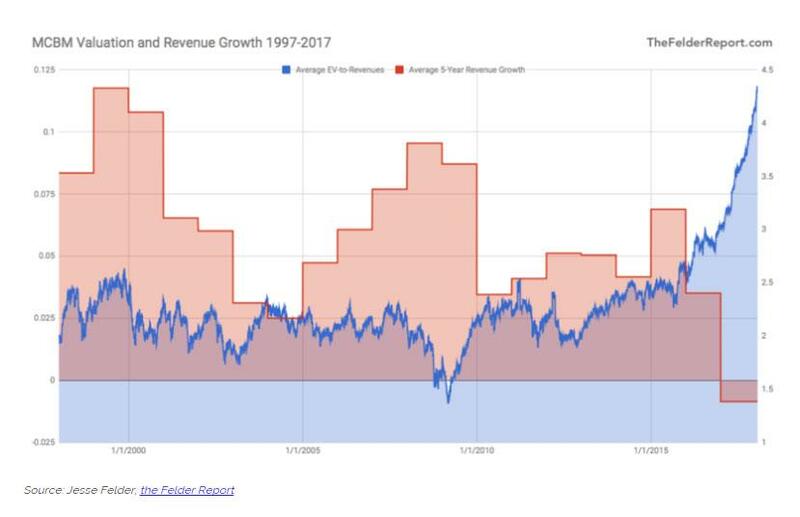 Except, for these four stocks, valuations are double as high as the peak of the past decades, while revenues are falling. Caveat emptor. 2. 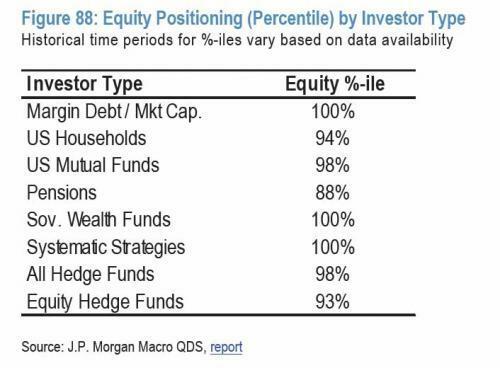 CASH BALANCES / POSITIONING: stretched. What matters is cash vis-a-vis financial assets. 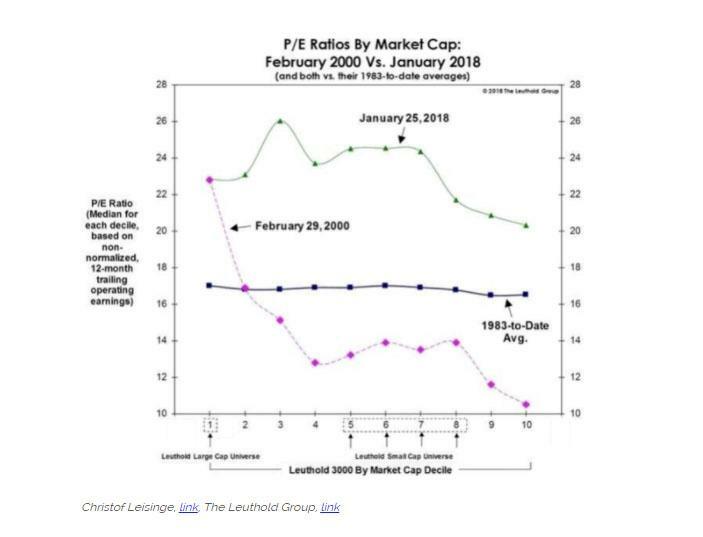 The valuation of “cash on the sidelines” works through stock prices. 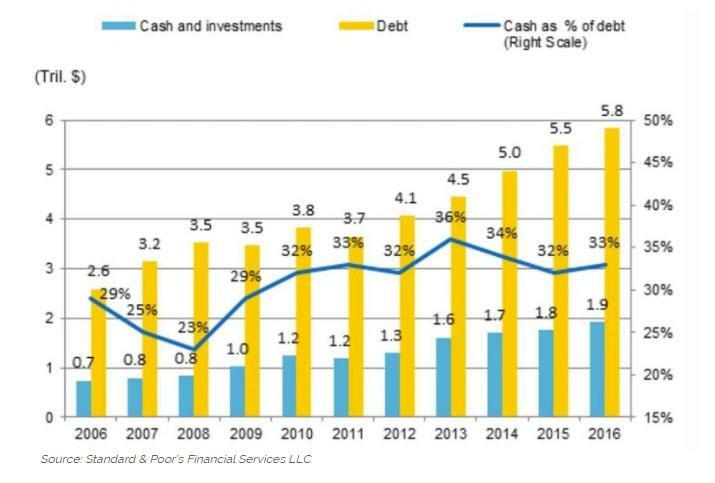 As prices move up and cash prices stay the same, cash naturally becomes a smaller part of the asset allocation mix of households and companies. 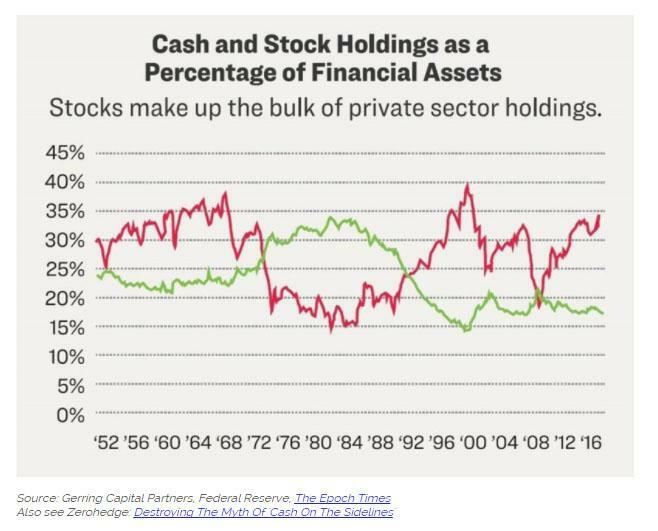 Cash today (green line below) makes up only 17% of the average private sector portfolio, almost half of what seen at the beginning of the 80s and close to the all-time lows of 15% experienced at the end of the nineties. The US personal saving rate dipped below levels last seen at the end of 2007, before the GFC started. 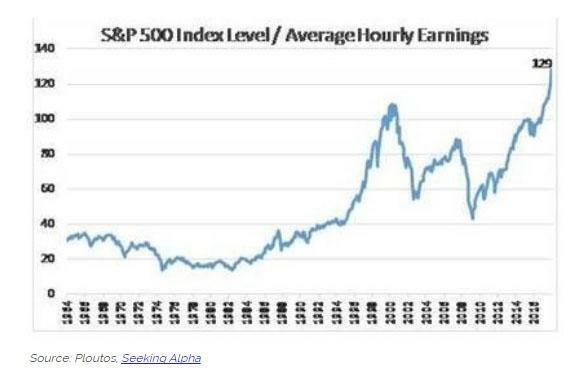 It now takes the average worker 129 hours to purchase the index level of the S&P. 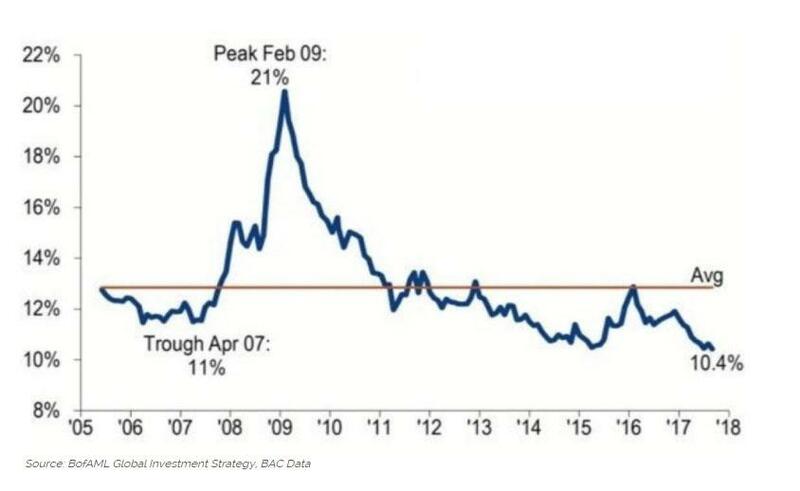 ​That is the highest multiple of all-time, exceeding the previous peak of 108 hours when the tech bubble was fully inflated in March 2000. 3. DEBT/LEVERAGE: stretched, especially within pockets of the system. 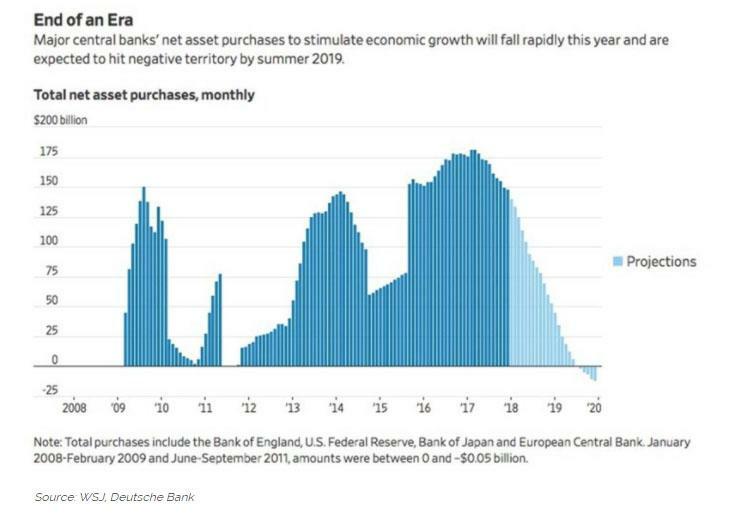 ​Extreme indebtedness and proximity to BIS’ debt saturation point / Rogoff’s debt tolerance limits / Minsky Moment for several subsets within the system, despite the record-low interest rates available to service such debt: China, Turkey, Japan, Italy. 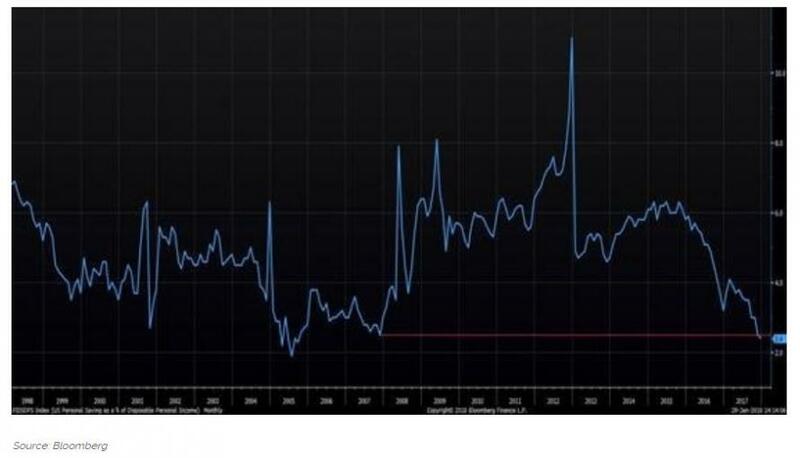 ​The list of data points for extreme indebtedness is long, not least the IIF metric of global debt on GDP of 327%, an all-time high. 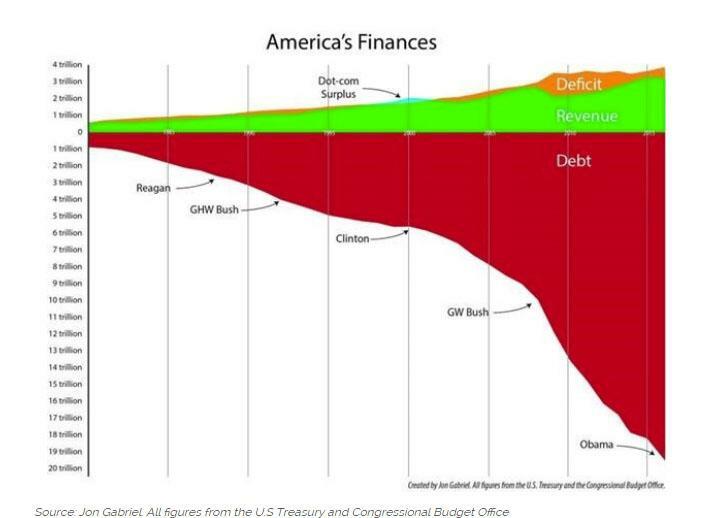 Here below we show graphically the exponential trajectory of US finances, just before tax cuts, infrastructure spending, rising deficit. 4. 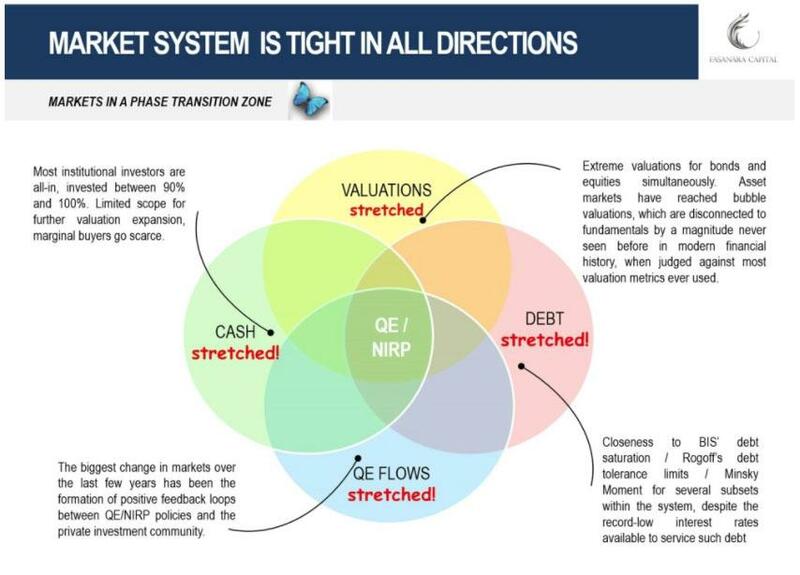 QE FLOWS/ PFL: stretched, and reversing. 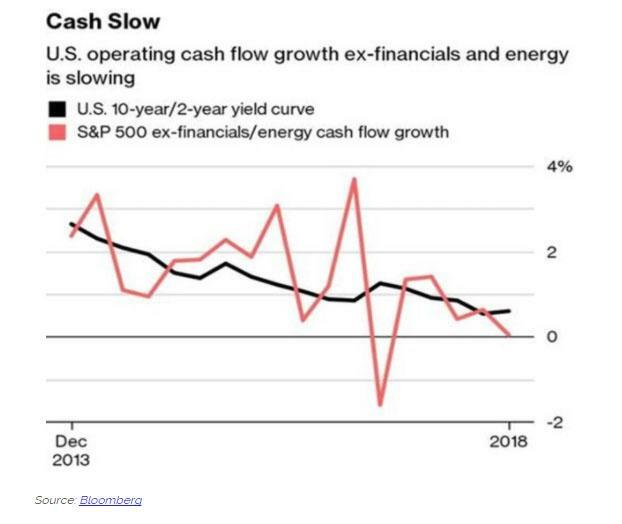 What happens when the system is tight at the same time across VALUATIONS, DEBT/LEVERAGE, CASH BALANCES, FLOWS? The system is tight in all directions, across all modules, which are also tightly intertwined. The probability of a critical transitioning is high when no modules within the system can pick up the slack and stabilise the equilibrium after perturbations.. Analysed through the lenses of Complex Theory, this may qualify as a phase transition zone, where a dramatic regime shift is impending. 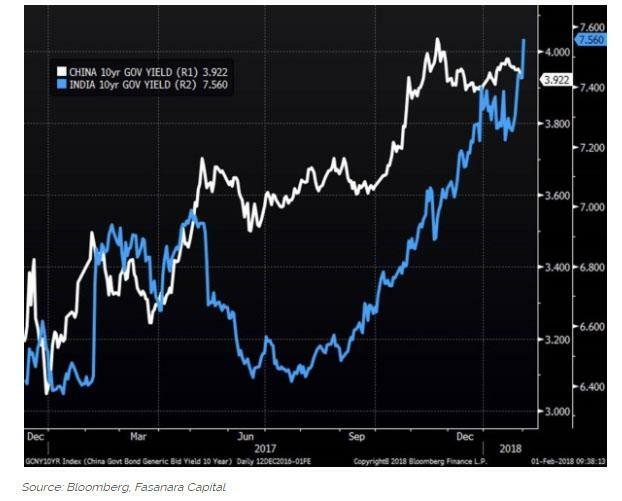 Markets are in an uncomfortable spot, where not much escape is available via new lending, not much escape via higher valuations, not much escape with new QE, not much escape with more leverage, not much escape with more cash to deploy. 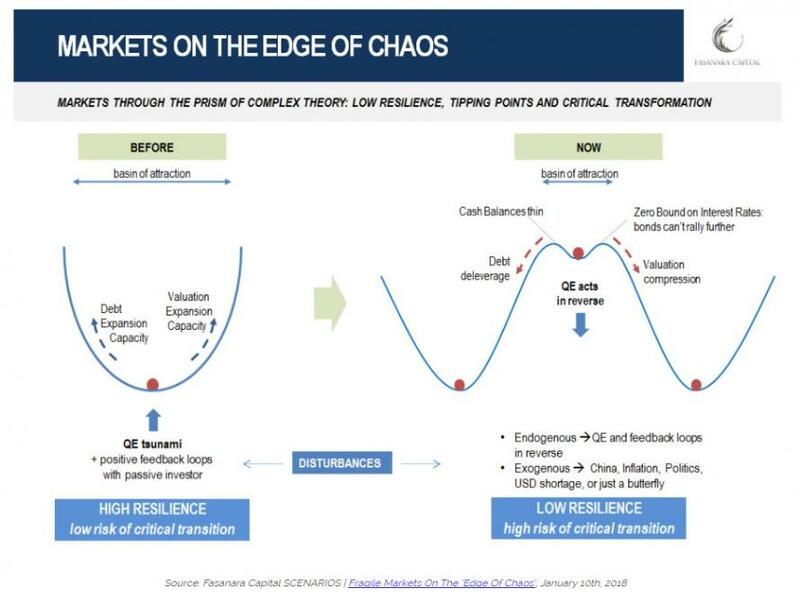 We are in a phase transition zone, where financial markets are fragile and sit on the ‘edge of chaos’. This is the zone where rare events become typical.